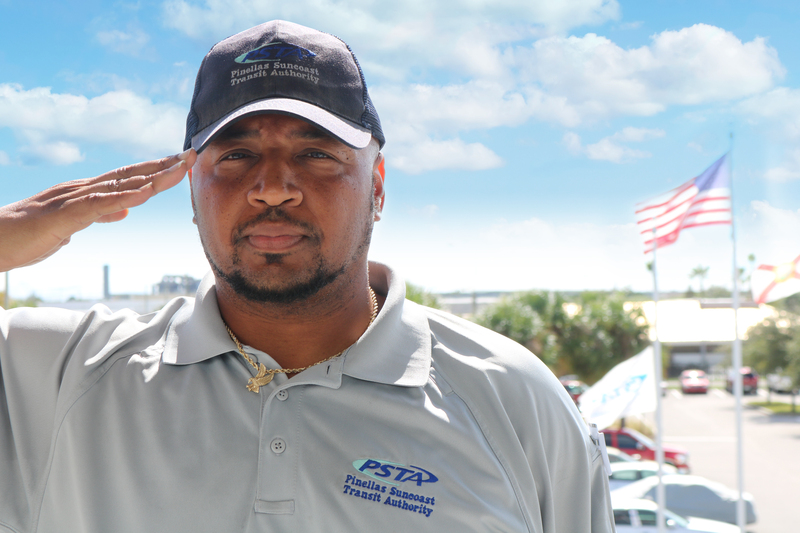 St. Petersburg, Fla. — Yesterday, the Pinellas Suncoast Transit Authority (PSTA) unveiled an innovative new program to serve disabled passengers, including veterans. The new mobility on demand program will be possible thanks to a federal grant the agency recently received, with strong support from Congressman David Jolly and Congressman Gus Bilirakis. Paratransit services provide more than 12,000 people with disabilities, including veterans, with rides to doctors’ appointments, work, school, and other critical destinations. This curb-to-curb service is tailored for those who, because of their disability, are unable to independently use the regular, accessible PSTA buses. Last year, over 275,000 trips were provided. Through the existing program riders must schedule a reservation at least 24 hours in advance to get picked up by a sedan or wheelchair van. The new program, the first with federal support, will allow paratransit riders to call the same day to get a ride, enjoying mobility on-demand thanks to partnerships with transportation technology innovators like Lyft. PSTA is recognized nationally as an industry leader in bringing new ideas, new technologies, and new innovations to public transit, including a first-in-the-nation partnership with Uber. PSTA Board members and staff accept an award for Transportation & Mobility at the 24th Annual Future of the Region Awards luncheon. (Seated L to R) Julie Bujalski, Patricia Gerard, Janet Long, Brad Miller. The first public-private partnership of its kind in the country. St. Petersburg, Fla. – The Pinellas Suncoast Transit Authority (PSTA) has been recognized for outstanding achievement and contribution to the region in the category of Transportation and Mobility for its new ride-share pilot program, Direct Connect, at the 24th Annual Future of the Region Awards Friday. The annual awards luncheon, hosted by the Tampa Bay Regional Planning Council, provides honor and recognition for notable achievement in the public and private sector for resource planning and management in the Tampa Bay region. PSTA first launched Direct Connect in February of 2016 as a solution to a very common barrier to public transit use—easy access to a bus stop. Often called the ‘first-mile/last-mile’ challenge, transit agencies across the country find that getting riders to a bus stop is the first step in turning them into public transit users. Direct Connect allows riders to use Uber or United Taxi to travel within a specific geographic zone to or from a series of designated stops. From there, riders can connect with the regular PSTA public transit bus system. PSTA, Uber and United Taxi join together to celebrate the success of this first-ever public-private partnership and for the recognition of this award. Meet Veteran William Butler Jr. If you ask William H. Butler Jr. how many times he has jumped out of an airplane he will give you an exact number – fifty-two times. The response comes instantaneously and without a doubt. As I sit across from William in the PSTA drivers lounge there is a certain air that follows him; an elegance. His hands sit folded in front of him and his posture is perfect. He is not your typical army veteran. Not rough or rugged but almost reticent and reflective. Today I will hear firsthand the stories of former Sergeant First Class in the U.S Army’s 82nd Airborne Air Assault Division—William H. Butler Jr. When William told me his name he wanted to make sure I included the suffix: Jr. He said it was important. At first, I wrote it off as habit. As someone with a very common name that is very commonly misspelled, I appreciated his clarity. But the more I began talking to William, the more I began to understand him and even more so his desire to be a part of something bigger – to leave a legacy. William joined the U.S Army shortly after graduating from Northeast High School, located in St. Petersburg, Florida. After being offered a number of scholarships to play college football, it was at the request of his grandmother that he first considered enlisting in the service. As a self-proclaimed adventurer and a thrill-seeker, I think William found his calling that day. During his first three years in the army, William was deployed to different warzones in different countries on different continents. He talks about the Gulf War and being a part of Operation Desert Shield and then after that Operation Desert Storm—memories he would only lightly touch on. “You don’t want to hear about that stuff,” he would say. What William enjoyed talking about was the jumps. When asked about his number one tip for jumping out of an airplane he had to think about it, but only for a second. As someone who is vocally terrified of flying in planes, I cannot even begin to stomach the thought of jumping out of one—but those were the moments William lived for. “Honestly, I joined to impress the ladies,” William laughed. “They were looking for people who wanted to go into the airborne division, and I saw the ladies start eyeing us. I joined right there on the spot,” he laughed. William’s laugh is absolutely contagious. After being convinced to join the army by his grandmother and then volunteering to jump out of airplanes by little more than a passing glance, I think it’s safe to say that William would do anything for the women in his life. Every jump comes with its risks. There are a million things that can go wrong at a million different times, but that was not something William ever mentioned. In fact, he told me an entire story about jumping out of an airplane only to find out mid-air that his parachute had blown a gigantic hole with a smile on his face. It’s not that he thought the situation was funny—actually he told me it was one of the most terrifying moments of his life. But to understand his smile you have to understand William. Having spent a total of 22 years in the service, William has gained a few army-attributes that you cannot scrub off. Aside from his frequent use of military jargon, he is relentlessly, tirelessly, unconditionally dedicated to what he does. The day after his crash-landing with a blown parachute, William went back up and jumped again. It is that same amount of dedication that he brought with him when he joined PSTA nearly three years ago. William talks about his passengers with the same passion and pride as he does with the army. He talks about the importance of leadership, responsibility, and respect. William told me leaders must be listeners—I couldn’t agree more. Of all the places William was stationed he told me his favorite was Germany. He recalls seeing the Eiffel Tower in Paris and taking trains across the country. “I owe that to the military…my bucket list,” he said with a smile. I couldn’t help but be jealous. There really isn’t a good way to end a story on William because in the few hours that we spoke I feel like there is so much more to learn about him. But if I had to wrap up William in a few words I would say that he is just what he always wanted to be—a legacy. The riders who know William on the many routes he drives, such as the 52 and 19, will not see him driving the bus on Veterans Day. Instead, he will be volunteering at Bay Pines V.A. hospital in St. Petersburg. Well William, on behalf of PSTA and the citizens of Pinellas County, I’d like to say thank you for your service and sacrifice. You inspire me, too. 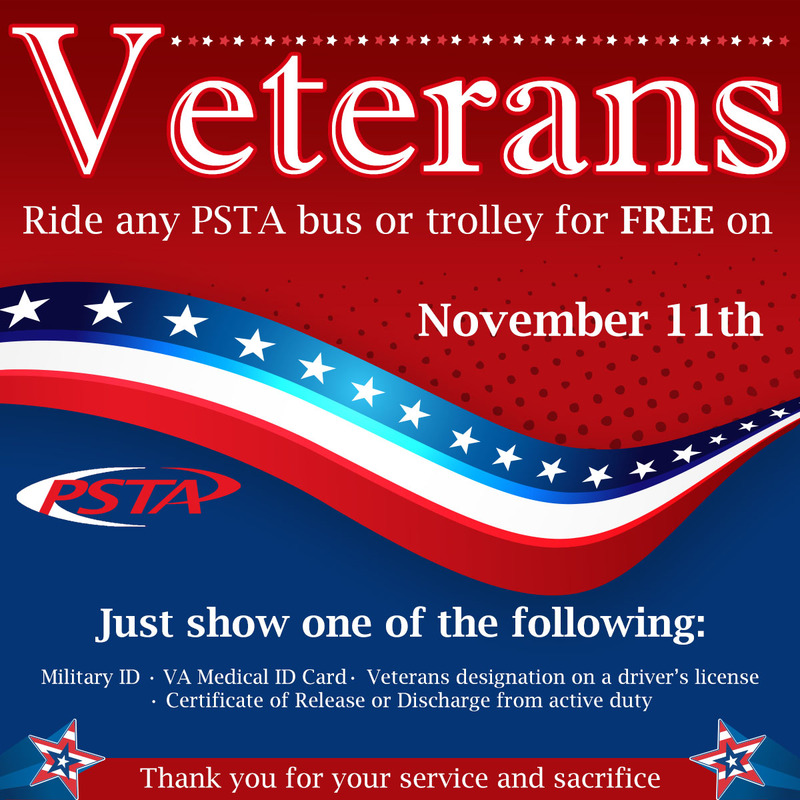 St. Petersburg, Fla. – The Pinellas Suncoast Transit Authority (PSTA) will once again offer free bus rides to active military and veterans in recognition of Veterans Day, Nov. 11. Riders are asked to show active or retired military identification when boarding any PSTA bus or trolley to qualify for a free ride. Acceptable forms of identification include a military ID card, Veterans Affairs medical card, veteran’s designation on a driver’s license, certificate of release, or a certificate of discharge from active duty. According to a projection made by the National Center for Veterans Analysis and Statistics, the Tampa Bay area has the largest veteran population in the state. Pinellas and Hillsborough counties are home to a combined 179,899 veterans as of September 2015, according to the report. PSTA buses proudly offer service to all three of the Bay Pines VA Healthcare System facilities that operate in Pinellas County. These facilities include the C.W. Bill Young VA Medical Center in Bay Pines and VA outpatient clinics located in St. Petersburg and Palm Harbor. The Bay Pines VA Healthcare System sees around 4,000 appointments a day– a feat Dangel says may not have been possible without PSTA. “We are kind of blessed here in Pinellas County because we do have great public transportation options,” said Dangel. For information on trip planning and individual routes please visit www.PSTA.net or call the InfoLine at (727) 540-1900. Another Record Year for PSTA! 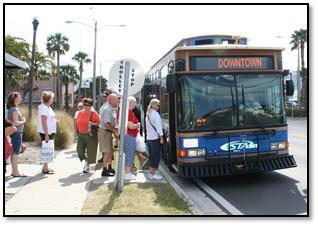 St. Petersburg, Fla. – The Pinellas Suncoast Transit Authority (PSTA) has set yet another annual ridership record with nearly 15 million rides taken in fiscal year 2014-2015. With eight record-breaking months this year, PSTA has proudly achieved its sixth consecutive year of record ridership. Passengers used the PSTA system a total of 14,898,825 times—that’s a 2.7 % increase and nearly 400,000 additional trips over last fiscal year. This new record breaks the highest standing record in Pinellas County’s 102-year history. Aside from its growing ridership, PSTA is looking at new ways to grow in downtown St. Petersburg. The PSTA Board will vote on the plan to reroute service near Williams Park at their November meeting.